Santa Ana, one of the oldest cities in Orange County is a hub for business. The Density of the buildings downtown makes for an interesting situation when it comes to termite control. Not only is Downtown compact but the residential neighborhoods around it are as well. This means that when a termite flys or swarms the proximity to neighbors is increased. Imagine having to fly 1/2 a mile to reinfest a neighbor vs 1/10. The infestations spread like wildfire in Santa Ana. With Infestations spreading quickly in Santa Ana not having termite coverage is like asking for an expensive wood replacement estimate. Termites damage wood quickly. Some entomologists have estimated the damage in the feet per quarter range depending on the infestation size. Imagine a 2×4 that’s 6 Foot Long damaged by over a foot in 3 months! That’s speed. In nature Termites are the forests recyclers taking fallen trees and turning them into manageable mulch for the forest floor. Its important to recognize these insects have a powerful part in the ecosystem of our planet. With that being said having termite protection could save you thousands of dollars. 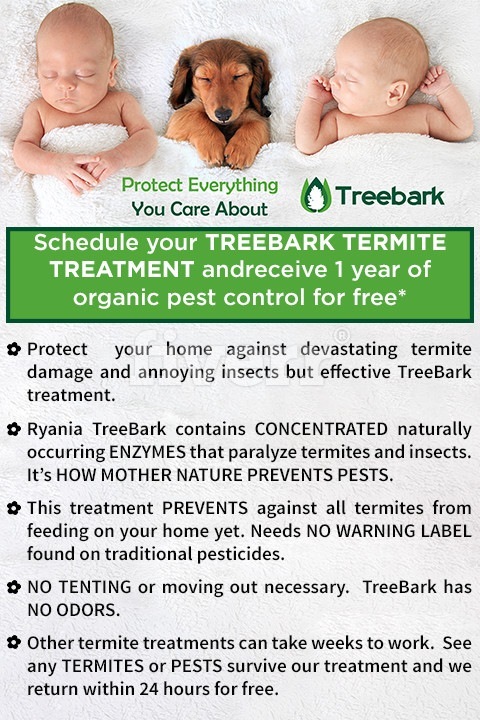 Treebark Termite and Pest Control Prevents Termites and Pests. Simply put your home needs a barrier to prevent your neighbors problem from becoming your problem. With Santa Ana homes being as close as they are a flying termite swarm could easily infest your home leading to future headaches. 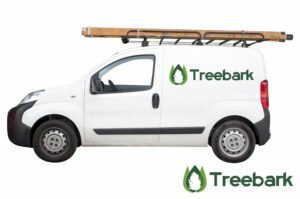 With Treebark Termite and Pest Control we lay a quarterly barrier that prevents the insects (not only termites) from taking home inside your home. If at anytime you see a bug we return at no charge and reapply the barrier. This barrier kills and controls anything that lands on it and tries to take residence. Call Treebark Termite and Pest Control Today or Use the Form Below to Schedule an Inspection. This tree contains a chemical compound called Chlorantraniliprole, and it is this compound which is responsible for the trees’ amazing powers of resistance. From there it was a simple matter of figuring out a way to extract and purify this chemical. As soon as we began testing this stuff, we realized that we had found nature’s ultimate weapon in the fight against termites! As part of our testing process, we began treating a house that was so infested with termites that no one could even live there. Within three months, every single trace of the termites was gone. To this day, the house remains free of all infestation. Because our revolutionary bug-destroying formula is totally non toxic, it is far more convenient to use than standard pest control chemicals (i.e. poisons). You don’t have to vacate your house and go stay in a motel or at a friends’ house. You don’t have to worry about the possibility of poisoning your pets or your kids. You can simply go on with your life and let us take care of that little tribe of insect squatters. If you are ready to employ the very best in termite control, call us today at 714-909-0575 and schedule your free estimate today! Don’t let those little trespassers eat even one more bite of your home! Act now and wipe them out like the invaders they are!